AUFX:Space, Virtual effect for iPhone / iPod Touch / iPad from Kymatica. 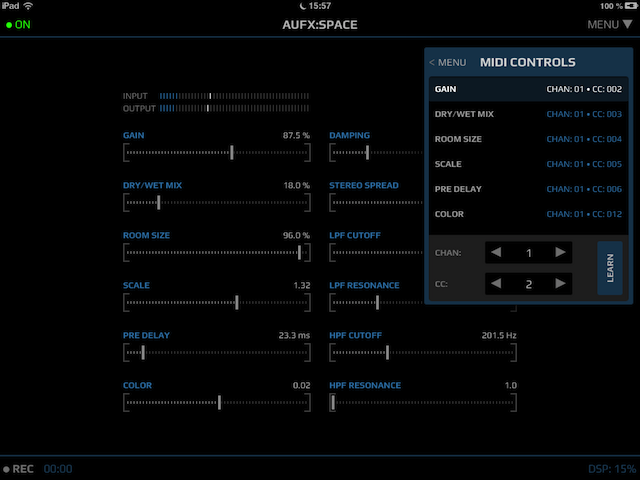 Kymatica has launched on the Apple AppStore the first of its new AUFX Series apps, the AUFX:Space reverb. The AUFX Series will offer iPhone, iPod Touch and iPad users several audio effects that can be applied in real time, MIDI-controlled and compatible with Audiobus (input, filter and output) and Virtual MIDI. All the apps in the series will feature an audio limiter to prevent clipping, presets, a recorder and export via AudioShare and iTunes. It will also be possible to create use presets. Each app is also equipped with a 32-bit DSP engine. 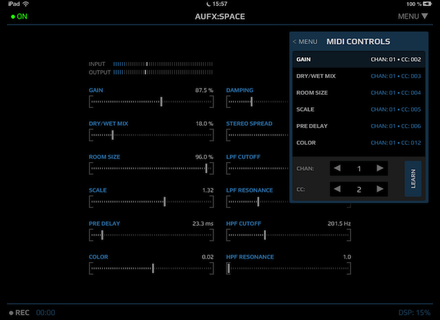 The first realization in the series is AUFX:Space, a reverb app with room size, scale, pre-delay, color, stereo width, dry/wet mix and gain controls. You'll also find high-pass and low-pass filters with cutoff and resonance adjustments. AUFX:Space is available at the AppStore for $3.99 / 3.59€. Sugar Bytes WOW2 now available Sugar Bytes has announced the release of the second version of its WOW filter plug-in for Mac and PC. Boscomac Hanky Tank for Reaktor Boscomac adds to its Reaktor add-in arsenal the Hanky Tank percussive module. Friday's Freeware: Double Treat Two nice new plug-ins have been released this week: a new tube amp at Ignite Amps and a distortion effect from FXpansion.